The University of Warwick and QuantIC researchers at Heriot Watt University and the University of Glasgow performed a study in optical sensing, which could considerably enhance the precision of measuring nanoscopic structures. QuantIC is part of the UK National Quantum Technologies Program and is the UK Quantum Technology Hub in Quantum Enhanced Imaging. The researchers used pairs of photons, which are essential components of energy that make up light, to develop a method that determines the thickness of objects that are less than a 100,000th of the width of a human hair. In the latest technique, two near-identical photons are fired onto a component called a beamsplitter and their subsequent behavior is monitored - with some 30,000 photons detected every second, and 500bn in use during an entire experiment. Identical photons tend to 'buddy up' and continue to travel together - the outcome of a mild quantum interference effect. As a result of this, the team’s newly developed setup provides the same stability and precision as current one-photon methods that, owing to the equipment needed, are more expensive. Providing a host of promising applications, such as research to better understand DNA, cell membranes, and even quality control for nanoscopic 2D materials of one atom's thickness, for example, graphene, the latest study represents a major improvement on current two-photon techniques with up to 100 times better resolution. While Photon A continues into a beamsplitter, Photon B is slowed down by a transparent object prior to entering the same beamsplitter. 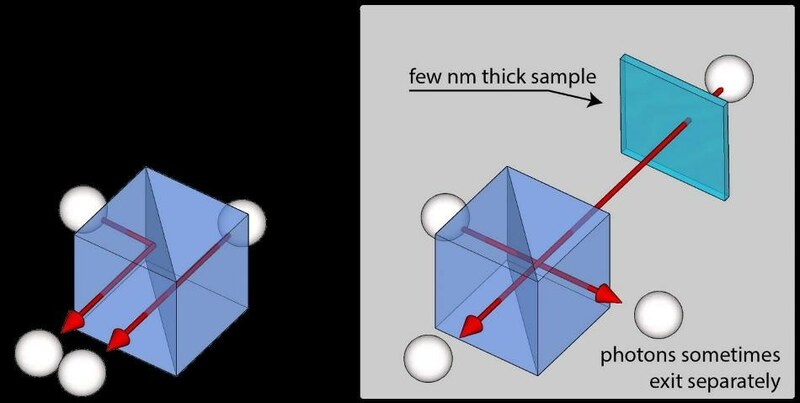 The possibility that the photons exit the beamsplitter together is subsequently recorded, thus enabling scientists to determine the thickness of the transparent object Photon B passed through. The photons are more likely to leave the beamsplitter separately when the sample’s thickness is increased. "What's really exciting about these results is that we can now investigate objects down at the nanoscale with an optical sensor operating on a fundamentally different physical effect. "Until now, so-called two-photon interference has not been able to achieve such great resolution, meaning that we are stuck with some of the downsides of the established methods based on single-photon interference - which requires more expensive technology than our new two-photon technique. "We have managed to get a big improvement by tuning the interferometer into a more sensitive operation mode and removing slow drift by repeatedly switching the sample in and out. "The advantages of being impervious to phase fluctuations and having large dynamic range mean that sensors such as ours could have a big impact on biological imaging and the associated research that it feeds into." "The results of our collaboration with the University of Warwick offer a range of potential uses, including research to better understand cell membranes and DNA as well as a quality control for nanoscopic 2D materials of a single atom's thickness, such as graphene. We are excited to be advancing quantum imaging and helping to maintain the UK's position in the development of new quantum technologies." Science Advances published the research titled, Attosecond-Resolution Hong-Ou-Mandel Interferometry.